I've made no secret of the fact that I'm obsessed with the new copper embossing powder - the evidence is irrefutable! Just loving the new copper embossing powder! This card is really a variation on a theme, using more of my favourite Affectionately Yours DSP - remember ... #loveitchopit ! The base card is Early Espresso and the flower is adhered to an Early Espresso layer cut with the Lots of Labels framelits. 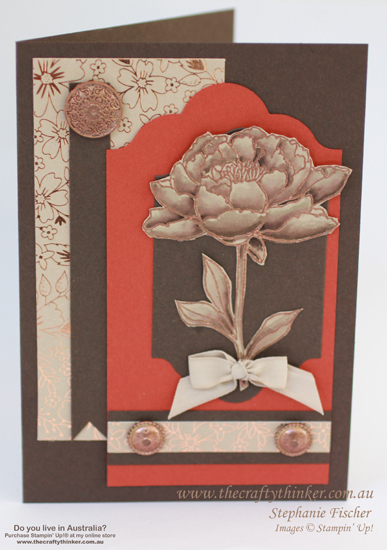 The Flower was heat embossed in copper on Crumb Cake cardstock and watercoloured with Early Espresso ink. I then fussy cut the flower. I added a bow of (retired) Crumb Cake ribbon. I trimmed a piece of Cajun Craze cardstock to size and then cut the top with one end of the largest Lots of Labels framelits. I added a strip of Early Espresso and an offcut of the DSP to this layer. I hand cut a banner end into a strip of Early Espresso and added it between the Cajun Craze and DSP layers for some extra definition. I finished the card with some lovely copper brads. What? Copper? Yes! They're Antique Brads that have been "copperised"! Hold the brad with a pair of tweezers and coat it with versamark. Dip it into a pot of copper embossing powder and then use a heat tool - voila - a copper brad emerges! I'm so sad that the Antique Brads are retiring - I really like them ... copper or not!